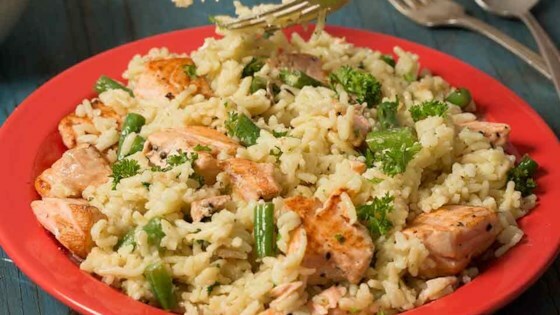 "Chunks of tender salmon fillet and green beans with a delicious herb and butter rice are ready to serve in just 30 minutes." Prepare Knorr(R) Rice Sides(TM) - Herb & Butter in same skillet according to package directions. Stir in parsley, lemon juice and salmon. Serve, if desired, with lemon wedges. It doesn't get any easier than this recipe - perfectly balanced, full of protein and absolutely delicious!